You can liven up your website by adding the weather informers, currency exchange rates, sports news, stock market indices, news, slide shows or contextual ads. 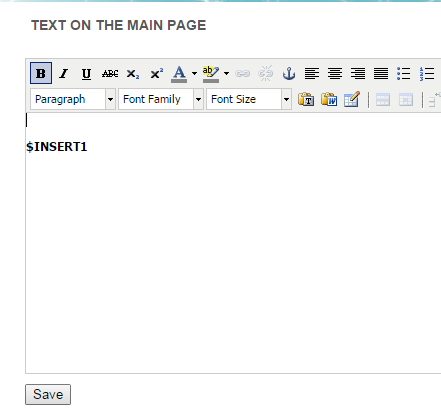 To insert a code you must already have the code that needs be inserted on the page. Let's say, we need to insert the weather informer from the "Yandex.Weather" website. 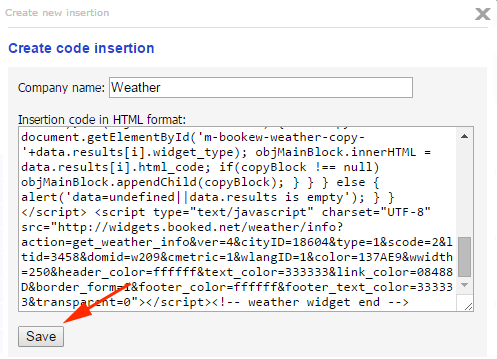 To do so, we must go to the "Yandex.Weather" website, choose one of the insertion format options and copy the code into the computer's memory. Please pay attention, that it is very important to select all of the code; don't forget the ending symbols. Code that was not completely selected and copied can cause design troubles and can even lock down your website after you insert this code into your website. For this reason please select all of the code that has to be inserted into your website when copying the code. In the management system's upper menu choose "Design" then "Code insertions". 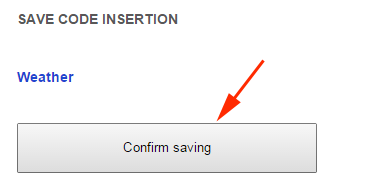 Click on the "Create new insertion" hyperlink. Select the necessary informer that you wish to implement into the website, for example, a weather informer. To install these informers, every service offers to copy the informers' code and insert the code into your website. After clicking on the "Create new insertion" hyperlink, write a suitable name for the informer in the newly opened form in the "Company name" field. For example, "Weather". In the "Insertion code in HTML format" field copy the insertion code from the computer's memory. Click on the "Save" button. After completing these actions, we have uploaded the informer to our website, and now we need to insert it to the desired place on the necessary page of our website. To do so, we have to copy the insertion tag. In point of fact the tag code informs the system that in this place instead of the tag the system has to produce the code that was saved earlier by this tag number.